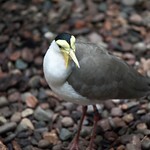 The masked lapwing has a bright yellow bill and face, with a black crown and white throat and chest. Its wings are gray. It can reach up to 14 inches in height. Australia, particularly the northern and eastern parts of the continent. Masked lapwings are considered a species of least concern by the International Union for Conservation of Nature. 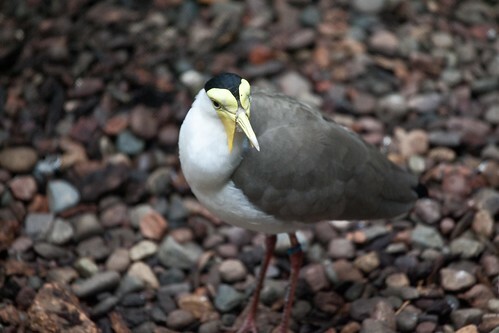 Lincoln Park Zoo participates in the Masked Lapwing Species Survival Plan®, a shared conservation effort by zoos throughout the Association of Zoos and Aquariums. An adaptable species, the masked lapwing favors wetlands but can found in a variety of habitats. Masked lapwings construct their nests on the ground and will defend them vigorously against animals—and people—that approach too closely. A masked lapwing chick was among the healthy hatches in spring 2016. President and CEO Kevin Bell shares more in a Post from the President.